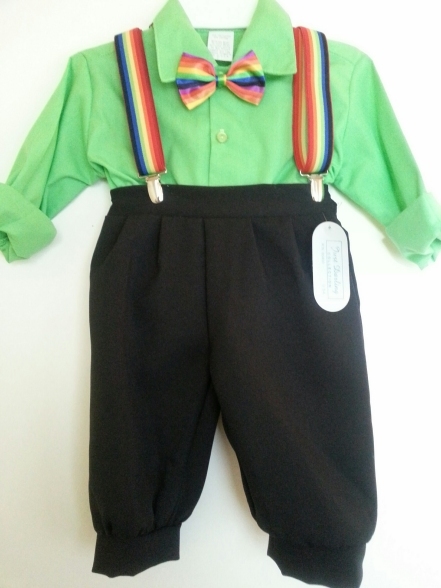 DapperLads exclusive - boys vintage style knickerbocker set with rainbow striped suspenders and bow tie. Sz 12m (1) only. The suspenders and bow tie are also sold separately and as a set in accessories. The suspenders are US made and measure 30 in. in length. The striped bow tie us a props bow made of satin. The 5 pc set includes a long sleeve lime green cotton poly shirt, polyester knicker pants, cap, and striped bow tie and suspenders. Note - The set runs small - order up a size from what your child usually wears. Refer to the height / weight chart and order up if near the top of a size.